Mass Spec Lab Employs the Leading Technologies & Processes that Accurately Identify & Quantify Constituents & Contaminants in Any Substance or Raw Material! Mass Spec Lab is a specialty analytical laboratory business created to serve industries requiring custom state-of-the-art chemical analysis of substances and samples, including pharmaceuticals, biomedical, biotechnology and related businesses. Mass Spec Lab was created to provide high resolution accurate mass tandem mass spectrometry analytical methods and strategies that are in tune with today’s ever more complex and difficult product development and regulatory demands that confront our customers. Mass Spec Lab’s mission is to work with the customer through every phase of the analytical project to assure timely and impeccably targeted data and guarantee that there will be NO “no results” outcomes for any study or project. Accurate Mass UPLC/UV/QTof MS provide the instrumental and software platforms to satisfy these analysis goals. The FDA continuously heighten their standards in the area of Leachables and Extractables test data, expecting data from more sensitive instrumental methods such as LC/MS and microscopic FTIR. This data needs to be interpreted, clarified and positioned, the ultimate goal is complete qual and quant. Do you want to rule out the presence of a contaminant, a cytotoxic component, surfactant residues or other unwanted analyte? Or perhaps address a chemical question posed in a regulatory review? Or alleviate a chemical risk or chemical R&D concern during front end product development? Molecules identified in untargeted screens often require I.D., especially for regulatory risk analysis. Structural elucidation of the unknowns (UV, accurate MS, & MSMS fragmentation data) thus becomes a paramount objective. Mass spectral fingerprinting of samples (solids, extract, chemical solutions, liquid formulations, solubilized thermoplastic materials) is a powerful method capable of identifying hundreds of compounds in a sample including components at concentrations in the ppms. Fingerprint maps are a powerful visualization tool we offer to track changes or differences in your materials. Stability testing is a core element of product development which requires an arsenal of analytical firepower enabling a product developer to engage in the battle of degradant and contaminant analysis integral to these studies. LC/MSMS and GC/MSMS are essential weapons. Chemical identification of volatiles/semi-volatiles with unit resolution mass analyzers depends on mass spectral matching to 70eV electron ionization (EI) fragment libraries (NIST & WileyRegistry) ... without which, chemical ID is unachievable. 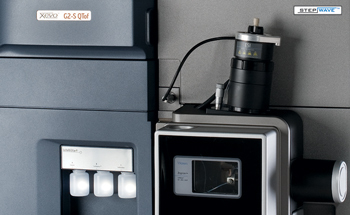 Analysis of volatiles/semi-volatiles with APGC-QTof overcomes the inherent limitations of low resolution GC/MS. Custom vs Contract Research Organization – Which C in CRO are YOU looking for? Contract Research Organizations (CROs) around the country and around the world serve the pre-clinical and clinical phase development of pharmaceuticals and biomedical devices. Most CROs continuously add capabilities to support large and multisite studies, and, in the current outsourcing climate, have attracted substantial venture capital and grown rapidly. Among other services, CROs provide long term, and large scale bio-analytical support, however, their rapid growth in this area seems to come with caveats. For example, the centralization of the bio-analytical services to a limited number of sites has promoted “factory” style, productivity driven, bio-analytical testing. The resulting emphasis on productivity and routine quantitative and qualitative studies predisposes the large contract analytical divisions to prefer large scale projects, especially those that come with less inherent analytical difficulty. 5) ability to provide in depth sample characterization including MS based structural identification of major signals of interest. We posit that whereas Contract Research Laboratories typically deliver on 1, 2 of the above requests, in routine projects, in addition to 1 and 2, it is the customer tailored components of 3, 4 and 5, which embody the capabilities of a Custom Research Organization like Mass Spec Lab. Contract analytical laboratories undoubtedly do great work, and are well suited for large scale, long term, and routine quantitative and qualitative studies. On the other hand, smaller, more fleet-footed Custom research laboratories should be the first option considered in cases where the custom component of an analytical study outweighs the routine, such as untargeted analysis, unknown chemical identification (impurities, degradants and side products), studies with very tight timelines, go/no go data critical to discovery project decisions, in other words, projects requiring high levels of versatility, flexibility, and technical expertise. Contact us for information about Mass Spec Lab’s portfolio of analytical instrumentation for your custom research need, including high resolution, accurate mass UPLC and APGC/QTof Mass Spectrometer, GC/MS, GPC and HPLC, microscopic FTIR spectroscopy, and DSC, NIST and in-house compound UV and MS libraries.